Joy in the Journey: Ahhh, life! There's always something, isn't there? Remember how I said it had been a rough week? Well, it's just getting laughable now. Seriously, like, sitcom funny. So, it all started last week with some health stuff and a healthy dose of personal drama. And one thing that you should know, right off the bat, is that this girl and drama are like oil and water. We don't mix. I don't know how to handle it! In my perfect little world, everyone is logical and rational and mature. You live in that world, too, right? It's not just me? Oh, it is? Hmm. Anyways, that one little piece of drama exploded due to an unfortunate decision on my part on how to deal. I made the mistake of being with someone right after I found out about the "unfortunate incident." (I like that; I think that's what I'll call it from now on...) Hysterical me (did I mention I don't do - or understand - drama?) unfortunately told said someone about the incident when I should have just kept my mouth shut. And that's how it all started. But you don't care about that. You want to hear the funny stuff, right? So my husband is out of town right now for work. I pride myself in being independent and absolutely self-sufficient. After all, I'm intelligent enough to handle anything, right? HA! Tell that to my kitchen sink! Long story short, I ran my dishwasher which backed up into my sink because the drain is clogged. Oh, and yes, I do know enough to remove the trap to clear a clog. Unfortunately, I am *not* good at estimating how much water a double sink can hold when I removed said trap... In case you're wondering, one bucket is not enough. ;) Oh, and also unfortunately, the trap wasn't clogged... and the S trap is the extent of my plumbing knowledge. So, now, I am "patiently" waiting for my hubby to come home to save me... or at least fix the drain. So the next thing I do is get my crock pot all ready for the day - and forgot to plug it in! Now THAT'S disappointment! And to top it all off, last night I went to get my hair dyed (yes, I'm 31 and gray. shhh!) and to get away from the world for a couple hours. And guess what happened? I got bitten in the face by a dog! Seriously, not making that up! I bled for what seemed like hours but was probably just 5-10 minutes, and it hurt. But I reacted as any sane human being would: once I applied pressure, I burst out laughing. Here was - finally! - something outside of my control! Something that was not a result of my choices or lack of knowledge! And you know what? It was refreshing, even if I did have a stream of blood running down my face! And I realized something last night after I got home. I was thankful for that little bulldog. Truly thankful. And as wild and twisted as the last two weeks have been, I learned that there is ALWAYS something to be thankful for. Always. And you know what else? When we are thankful, we are better inside and out. 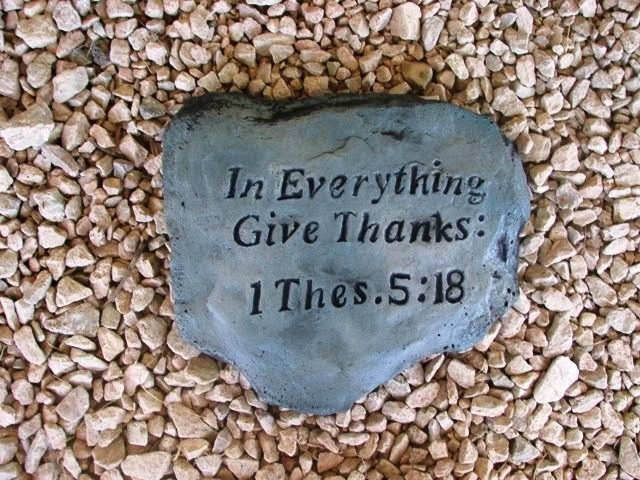 And thankfulness begets peace. And peace can get us through anything. We have the choice to curse the rain or be thankful because it will bring new growth in the spring. We have the choice to find that one bit of goodness. So what will it be? Which will you choose? Bitterness or brightness? Hate or health? Pain or promise? Just a little something to think about.